The Outlaws and Ghosts of The Natchez Trace, a working title for now, will be released in 2015. Its release will culminate a long journey of intrigue and fascination that began in the early 1990s. At the time, I lived just outside of Nashville, on McCrory Lane. Directly across the road from me was the northern terminus of the recently-completed Natchez Trace Parkway, a modern highway that roughly follows the path of the old Natchez Trace. The Natchez Trace was a footpath that led from Nashville, Tennessee, to Natchez, Mississippi. Created by prehistoric animals and used by Native Americans for centuries, the Trace became a major trail for European and American explorers and traders in the late 1700s and early 1800s. Despite the presence of today’s modern parkway and thousands of visitors each year, the Natchez Trace’s enduring sense of time, place, and mystery is ever present along its 440-mile path through the wilderness. Although the Trace is known for its natural beauty and rich history, it is also shrouded in mystery. Tragic, often savage events were common in its early days when foot travelers attempted to make the grueling, six-week trip from Natchez to Nashville. Because most of those travelers carried large sums of money, the Natchez Trace became a haven for land pirates, thugs, and even cold-blooded killers. Some travelers managed to evade or fend off the hoodlums, only to succumb to disease, snake bites, or other perils of the wild before they could make it home. With its sad and often bloody history, the Natchez Trace is the collective footprint of tragedies past. And, as one might expect, the horrendous events that occurred along its path over two-hundred years ago left behind a spiritual residue that still lingers today. Ghosts of weary travelers, friendly innkeepers, and infamous outlaws keep a vigilant watch over the old Natchez Trace. Who were they? Why have they not moved on? Is there something they want to tell us? As an avid, lifelong researcher of history and the paranormal–and a Southern author to boot–I have studied the Trace for many years. The place has always intrigued and fascinated me, and no fewer than one-hundred people have told me that I “definitely” need to write a book about the Trace. But that was easier said than done. Although living on McCrory Lane had its advantages, such as spending every weekend and holiday driving the Trace and scouting all of its trappings, another book project lay in front of me, one that I had been researching ever since I was a child in the 1970s–the Bell Witch. After the 1999 “short version” was released, followed by the comprehensive, 406-page version some time later, pressure from the reading public forced my writing and research to take a more paranormal turn. So that, I did. And I still do. History and exploring historic locations is my first love, and the paranormal is my second. It gives me great pleasure and satisfaction to finally be able to commence working on the Natchez Trace book. Although I will cover lots of paranormal locations and stories, the book’s common thread will be history. And, most notably, the history of those who MADE the Natchez Trace such a haunted location in the first place: the ruthless, throat-slitting, disemboweling scoundrels who made it their sinister playground. I am looking forward to weaving this nasty and unnerving tapestry of greed, bloodshed, and the supernatural. Posted in Alabama, Books, folklore, Forthcoming Titles, Ghosts, Historical Fiction, Mississippi, Paranormal, Tennessee and tagged alabama, amwriting, bandits, books, folktales, ghosts, historical fiction, land pirates, mississippi, Natchez, Natchez Trace, outlaws, paranormal, spooky, Tennessee on November 28, 2014 by Pat Fitzhugh. 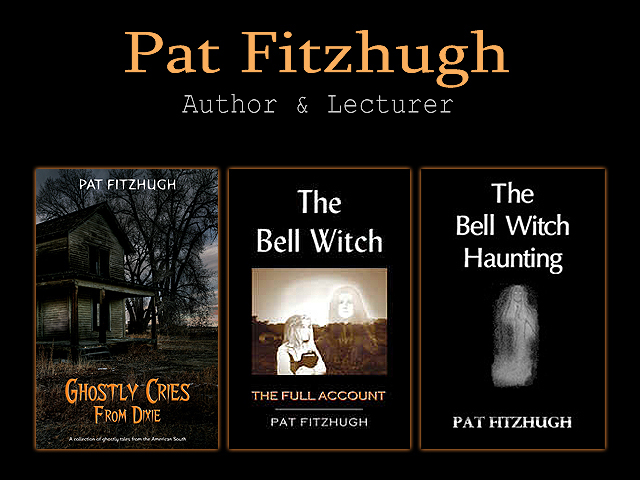 Pat Fitzhugh is best known for his extensive research and books about the history, legends, and lore of the American South, and his epic investigations of the paranormal. His experience in the field spans nearly four decades. His work has been featured in major newspapers and magazines, and he has over 300 radio and TV gigs to his credit, including appearances on The Learning Channel, The Travel Channel, Turner South, and A&E. He also appeared in the 2006 motion picture DVD, “An American Haunting,” starring Sissy Spacek and Donald Sutherland. When not researching cases and sharing his findings on radio and TV, Pat Fitzhugh can be found speaking at paranormal conferences, teaching classes on paranormal research, and leading live, professional investigations of America’s most haunted locations. Copyright © 2012-2017, Pat Fitzhugh; all rights reserved. Unauthorized use and/or duplication of any material without explicit, written permission from this blog/site’s owner is strictly prohibited. Excerpts and links may be used in the interests of education and fair use, and in a non-defamatory manner, provided full and clear credit is given to Pat Fitzhugh and www.patfitzhugh.com, with appropriate and specific direction to the original content.